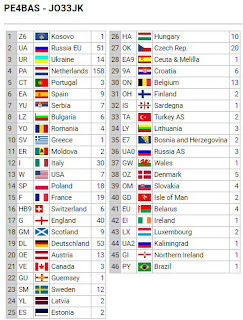 Well, it was a nice contest again, I think the most important one for us Dutch. Started a little late but that doesn't matter that much. Propagation was not really good. 10m and 15m were closed except for one station (RL4A) which came in here at S9 at sunday as the only foreign station on the band. Because of those closed bands the amount of multipliers was less compared to the last few years. 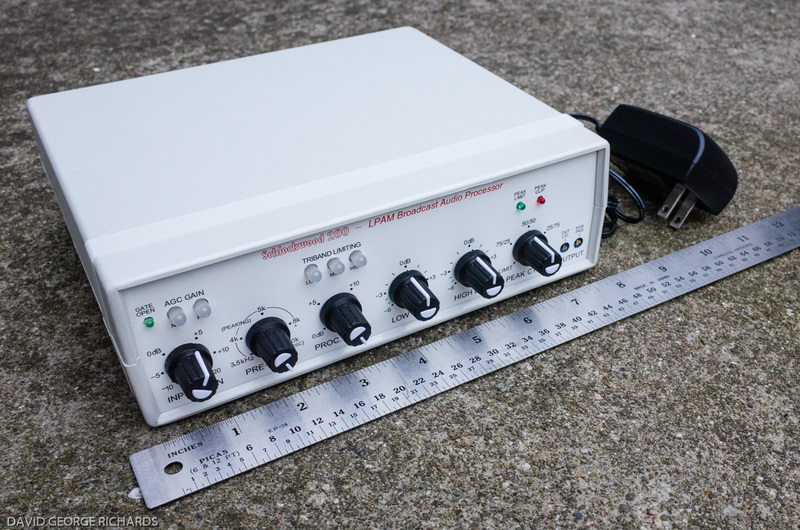 20m was open but not good enough for a vertical or a wire antenna like my inverted-V although I worked some DX. The first station I worked in this contest was Z60A for the first ATNO of this year. 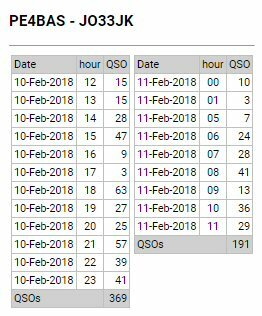 40m, 80m and 160m were reasonable but not really open for short distances so I guess I miss a lot of QSO's from inside the Netherlands. 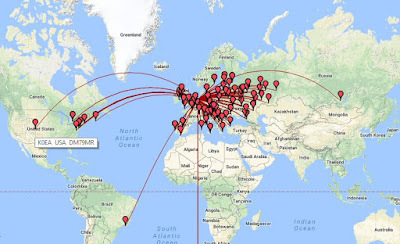 The last couple of years I always worked at least one station from USA or Canada on 80m but this time nothing was heard. 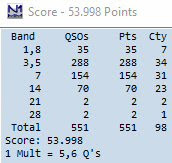 80m was my best band counting the amount of QSOs, not surprising with a 2x20m inverted-V as antenna. 46 DXCC were worked. I expected more activity from Belgium as they share the Dutch/Flemish language but only 13 were worked in total. I guess they were more interested in the RTTY contest? Or active on CW? 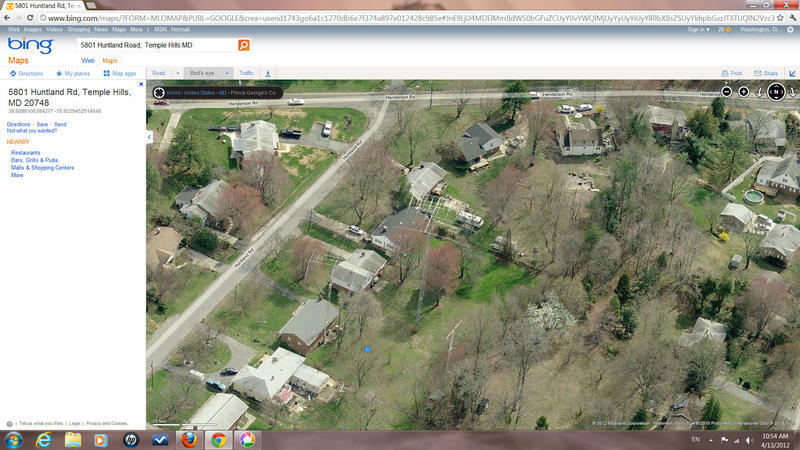 Map from my contacts. ODX was PY with 9760km (20m). K0EA was interesting! It is nice to be able to see my on-off times. Best times in for DX are always the greyline periods so I tried to be on the radio at those times. But sometimes propagation is a strange thing. 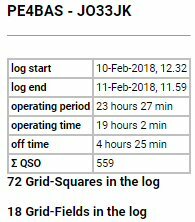 K3ZO (USA) responded on my CQ on 40m almost 2 hours after my sunrise! He has a amazing antenna setup or we were just lucky! You can clearly see when I had dinner saturday, when I stopped en when I started again sundaymorning. As you can see I started a half hour too late because of visitors. I was off for about 4,5 hours to get a little sleep. Most of my contesting time has been spend running (calling CQ) I did less S&P (searching for multipliers) this time. N1MM+ has a excellent multiplier screen but as soon as sunday nothing much showed up new much. So calling CQ was the best way to go on I think. I aimed for 100 multipliers.... almost got it! However, the best part is to meet some friends again, the guys that you know personally but are living far away. Most of them participate in the PACC every year, some of them don't but are especially searching for me. Especially Regin OY1R/MM was a nice encounter on 160m. He was at the ship 130km from the Dutch coast on the Northsea. We met each other while he brought me his QSL personally when his ship was in the harbour nearby 2 years ago. Hans PE1BVQ sent me a short video from my last contact as received at his QTH. Propagation might be not the best but I had a lot of fun after all and that is the most important thing in this contest. Nog bedankt voor het spotten het heeft wel geholpen cw heb ook even gedaan cq geven maar dat ging niet goed er kwamen zoveel terug dat het programma het niet kon coderen. 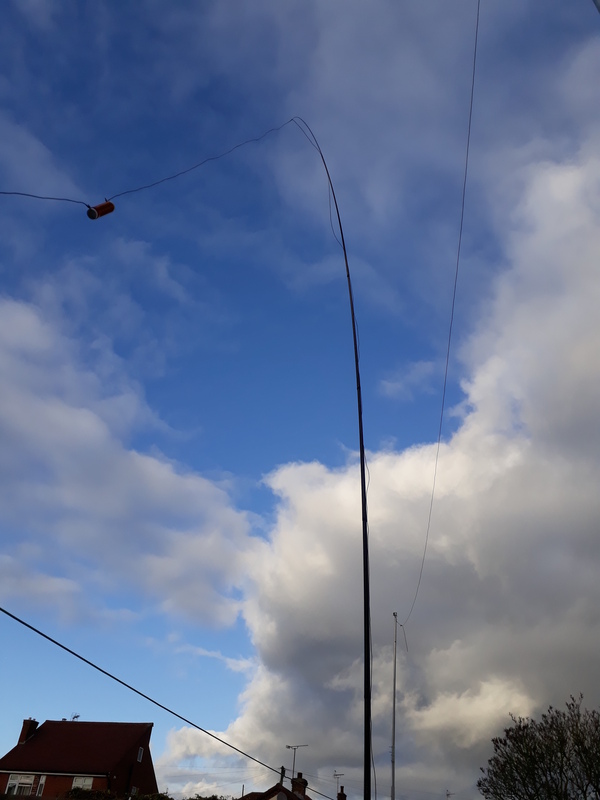 Hallo Bas, gezien de beperkte hf-antenne hier en de positie, had ik niet verwacht een QSO met je te kunnen maken op 80 meter. Het signaal varieerde hier behoorlijk en ik moest echt wachten tot voor een beter signaal. Het opgenomen stukje klonk net weer goed, daarvoor was het signaal in de ruis. Jammer dat 40m in Nederland slecht ging. In iedergeval heb jij je score/punten binnen.